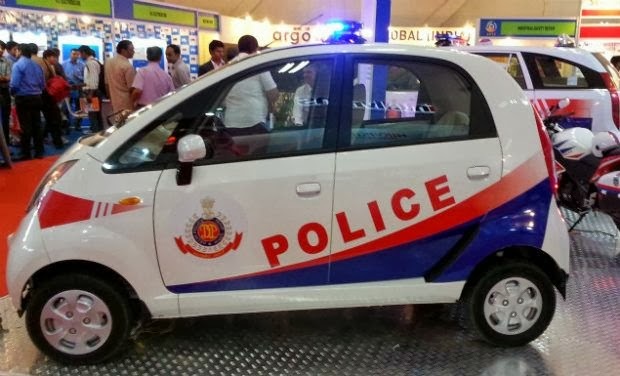 Tata Motors showcased the Nano as a probable contender for Delhi Police at the ongoing International Security Expo taking place at Pragati Maidan. The car was unveiled by Mr. Anil Goswami, Union Home Ministry. The security firm "Grand" who has been supplying similar vehicles to Delhi Police says the vehicle could be used by lady police personels in Delhi to rescue kids and women in distress on Delhi roads. Mr. Goswami said that he would ask officials and police forces to give this Nano a look and whether it could be of use to them. We have just launched a concept of using the small car for emergency response instead of the big PCR vehicles being used at present by Delhi Police. We would want the police and other agencies tasked for exigency duties to have a look and see if this fits their bill.